New Year's Day was voted No. 6 in the Best Single category in the New Musical Express poll and No. 9 in the Best Single category in the Sounds poll and became U2's first top 10 single in the UK. It reached No. 53 on the Billboard charts. New Year's Day remains a popular song for other artists to sample or cover. With It Guys used the piano line from New Year's Day as a sample in the song Let The Music Take Control. Manchester rappers Kiss AMC sampled the intro for their song A Bit Of U2. The group Dynamic Base used the sample on their Africa single and Bacon Popper did the same on the Free single. Hyper Logic also used a sample in Only Me. Route 401 on World of Dream, Volume 2. Route 401 also released a single with 5 dance remixes of New Year's Day. Ferry Corsten had also done an unreleased remix of New Year's Day in the spring of 2000. It can also be found on the Christmas Of Hope (with proceeds being donated to the City Of Hope), The One And Only 80's Album, Chart Runners Volume One, The Hit Squad's Hits of 1983, and The Tube compilations. New Year's Day was the first single released from the War album. It also appeared on U2's EP and video for Under A Blood Red Sky and the Best of 1980-1990/B-sides compilation. The cover of the single features Peter Rowan who is the brother of Derek 'Guggi' Rowan. Rowan appeared on the cover of several albums and singles. Polish dissident and Solidarity union leader Lech Walesa inspired the song. 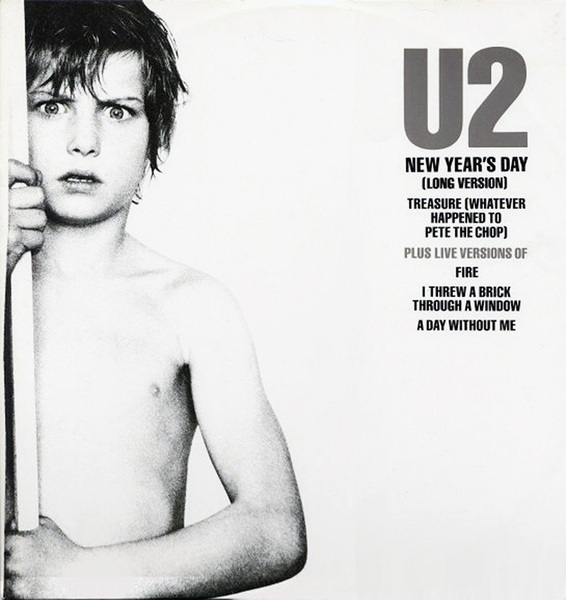 New Year's Day was one of three songs from the upcoming album premiered in Glasgow on December 1, 1982 when Bono informed the crowd that the single would be available in stores on New Year's Day. However, the song ended prematurely due to feedback from Edge's amplifier. U2 played the song for the first time in Belfast on December 20th stressing that it's not a rebel song. A live version, recorded at the Rockpalast '83 concert in Lorelei, Germany on August 20, 1983 appears on the EP Under A Blood Red Sky.